Hi! Got my chowchow yesterday. Until now she is not eating. She just stay in the corner of the cage. She is not walking around too. She looks shy and feared. Please help. Btw her food is beef pro. Not that unusual for a young pup. My now 2 and 1/2 year old male barely came out of his travel crate the 1st day, and then sat in the same spot for another. Once he gained confidence he was fine. Remember, pups have a very limited view of the world when they are rehomed. At about 2 months old most are transplanted to a strange place with new people, and without their littermates. At 3 months your pup is even more accustomed to being around familiar territory. It's a big transition, but they overcome pretty quickly. Don't change the food, that is probably not the issue. Pup is a BIT stressed and is more worried about the new surroundings and people. If it goes longer than a couple days, then be concerned. Otherwise, just try to interact. Did you get a favorite toy or blanket to take home, that often helps. Something with the old smells to make a connection with. Lie on the floor and just pet the dog to make it comfortable and build a bond. Sometimes the travel crate or and enclosed spot with provide some security. Sounds like your girl is overwhelmed by all the changes. You might consider covering the top and back side of the cage so that it feels a bit more secure. It took Ursa a long time to feel safe and secure. Lying on the floor sounds like a good idea. You want to make her secure in her new home and comfortable with the people who live there. Keep us posted on how it is going. Thanks! Two of you are correct. But i added a boiled chicken liver to her food and she started eating since then! And energetic too. Ursa's daddy wrote: Sounds like your girl is overwhelmed by all the changes. You might consider covering the top and back side of the cage so that it feels a bit more secure. It took Ursa a long time to feel safe and secure. Lying on the floor sounds like a good idea. You want to make her secure in her new home and comfortable with the people who live there. Thank you!! She looks happy now.. my bf's husky visited us and we are shocked when my chow became jolly she jump run and play with the husky. But i never heard her bark. Haha is it normal? Rory's Dad wrote: Not that unusual for a young pup. My now 2 and 1/2 year old male barely came out of his travel crate the 1st day, and then sat in the same spot for another. Once he gained confidence he was fine. Thank u. U r right... im giving her chicken liver with beef pro. Is it okey? Can i give her supplements? Like fish oil? My dogs eat a modified raw diet...cottage cheese for breakfast and alternate ground turkey/chicken breast/ground beef for dinner. They always have kibble available as well. No issues as far as i know i with chicken liver, probably a good add on. As for the supplements, most aren't going to do any harm, but the benefits are argued. With a good quality food, they probably aren't necessary, but again, dont really have a downside as far as i know. 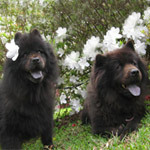 My chows don't bark that much unless there is something they see. I am fostering a Chow Samoyed mix, and he wants to bark all the time for no particular reason. That is rubbing off on my two chows. prettyglai wrote: But i never heard her bark. Haha is it normal? 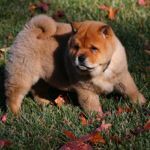 My first Chow didn't bark until he was 4-5 months old. I also remember wondering if that was normal. I didn't need to worry. He would howl when he heard sirens. My current puppy started barking at 2-3 months, but stops when I acknowledge that I've heard his warning. And sirens don't bother him. What sets him off are squirrels. The bark becomes higher pitched and he goes on until the squirrel disappears up a tree, over a fence, etc. Yes, I know that high pitched bark. Ursa likes to use it for squirrels, but especially if she sees a bird on the ground. She is fascinated by them and will carry on a long conversation telling me all about them. One thing I love about my Chow is that she hardly barks unless there is some urgency like she is hurt or there is a stranger.